Help Emma restore her grandparents' old house back to its former glory! Make money from garage sales to buy furniture and new fixtures for their old house! 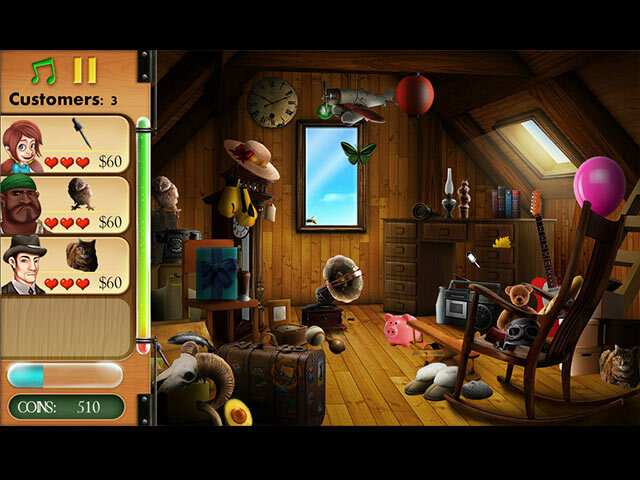 This extraordinary Hidden Object game is significantly better than the average ones you've been playing all this time! Hidden Object: Home Makeover is a Hidden Object, decoration and Match 3 game with unlimited levels and gameplay time, all in one package! Hidden Object: Home Makeover is rated 3.4 out of 5 by 48. Rated 5 out of 5 by Amijane from A really good makeover HOG! I enjoy playing these straightforward HOG makeover games a lot. This is one of the better ones. Good graphics, really liked the music and you get extra coins in the scenes and can zoom in to have a better look. Best of all though was the householdtips!!!! I live in a country which is cold 7 months a year and we now have an icefree entrance for example. After every scene you get a tip and some are just golden ones! Rated 5 out of 5 by deeanddeeann from I LOVE, LOVE , LOVE, LOVE, THIS GAME!!!!... IF YOU LOVED PLAYING GARDENSCAPES, YOU'LL LOVE THIS GAME!! AFTER I GOT DONE MAKING OVER THE GUEST ROOM, THERE WAS THE WHOLE FRONT PORCH TO FIX!! THE STATUE IS VERY BEAUTIFUL!! THIS WHOLE ENTIRE GAME IS SO WONDERFUL!! Rated 5 out of 5 by denniann2 from buying and selling to fix up the grandparent's home it is a typical game like the others. a mix of M3 and sellling to customers. timed or untimed. there are 2 places to makeover. Rated 5 out of 5 by klomps from Fun game! Great Hidden object and match three great game! 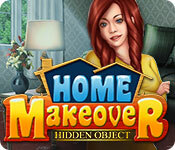 Rated 5 out of 5 by mehebert from Hidden Object Home Makeover I really love this game and games like it. I don't know if the developers are going to see this or not however there should be more rooms to decorate and fix up. There are only two in this game and there should be more to make it more fun. Suggestion would be dinning room, bedroom, kitchen, etc, and not just the front porch and living room. Also more items to choose from. Rated 5 out of 5 by sashasabre from Very Satisfying and Fun To Play If you like earn to furnish or design things, you will like this game. 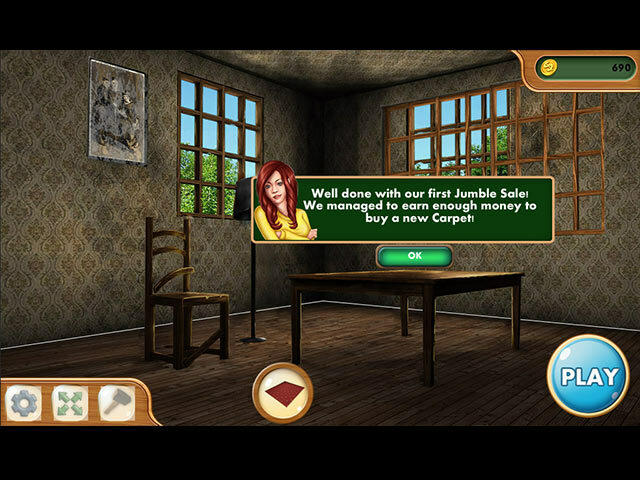 As you solve the hidden object puzzles you earn money that you can use to furnish a house. I only wish they would give more than 3 choices in the furnishing categories but it's a minor point. The hidden objects are not too very hard. I would say just enough to be a challenge but not impossible. I think the difficulty is moderate which is just what I like. What I would like to see is a Halloween version of this game! Rated 5 out of 5 by iou001 from Relaxing Game These are my favorite type of games. I wish there was more of them. The hardest part about this game is trying to figure out how to exit out of it. Once you've figured that out the game is so much fun. I love searching for a bunch of objects at once instead having to go to one scene, find one object and then go back to a previous scene to use it. I love that this game has a relaxed mode for those of us that like to play games and watch TV too. We can take our time playing the game. And I love the bright clear graphics. Rated 5 out of 5 by arnold1049 from FOR DYED-IN-THE-WOOL HOG LOVERS In the storyline, you are helping to renovate an old home for your relative and for a place to live. In order to get the money to do so, you must have sales. Therefore, you have customers with which to interact. I love pure HOG games, even if they get a little repetitious. I played the timed game; there are only 2 levels of difficulty, timed and not. I applaud the developers for making this choice available, as I don't usually like playing under the created stress of time limits. However, this game has reasonable time limits and the consequences of not meeting the set time are minor. You collect less money, which takes you longer to purchase the items needed to decorate the house. I played the first part of the game, where the purpose was to decorate the living room of the house, and was a little disappointed when I thought this was the end of the game. Wrong. Now I'm decorating the porch. After that, I'm not sure what happens. However, in order to start on the porch, I had to have accumulated a total of $20,000, which I hadn't. So it was back to playing more HOS until I had earned the requisite money. Under the "Extras" tab, there are about 6 ways to play the game, depending on how you like to see the list of objects; pictures, silhouettes, names, etc. I'm guessing that, for each HOS, you can play it six different ways. Providing these "extras" makes the game extremely versatile and I would imagine very long. During the time I played, even within one HOS, the way the objects are listed changed within the scene. Really made it interesting. For example, maybe the first few objects were named, then the list changed to pictures, etc. There are also "memory" HO lists, something I've not seen in a HOG before. I was shown a list of objects, first pictures of them, then after a few seconds of study, I was taken to the HOS to find the objects based on my memory, and again with a time limit. Later in the game, the pictures of the objects changed to the names of the objects and the list got longer. I can see silhouettes used, as well as other variations, maybe later in the game. There are also several different ways time is used to increase the difficulty. The first is a straight forward list of items that must be found. However, the items are attached to a customer and with a price that the customer will pay for that item. Helping all the customers purchase their items, by finding them in the HOS, must be done within a given amount of time. Since the scenes repeat themselves a lot, this gets a little easier, but the items in the scenes move around from one scene to another, and other items are added. Really keeps you on your toes and the "repetition" really wasn't a factor. In this variation, adding to the difficulty of meeting the time restraints, just finding the object isn't enough. You must move your cursor over the list and collect the money earned by the sale. That allows the next customer to come in to show another object that must be found. So if you don't collect the money and allow another customer to come in, you lose time. But moving back and forth between the list and the scene also takes time. I developed a strategy where I would find 3 objects in the scene, then collect the money. Four customers appear at one time, with the total number of customers (objects to be found) varies from scene to scene. Not sure this strategy saved a lot of time, but at least it kept my head from swimming with all the back and forth. If time runs out before all the customers have been taken care of, you are allowed to finish the customers on the list at the time, but no new ones come in. Another timed HOS occurs when the customers come, one by one, to purchase a specific item. In this case, each item is timed, not the whole list. If you don't find that customer's item, then the next customer comes in. I've not seen this variation either. A third timed test is, as mentioned before, the memory test. And the forth is finding X (usually 20) of a certain object, like animals, or clothing. Hints are available, but take some time to recharge. When you are trying to beat the clock on finding the objects, this recharge time can take too long and the scene timer runs out before the hint can be used again. To help add to your money, there are several coins hidden in each scene for you to collect. Of course, this also adds to the time you spend on the scene. And there is a set of "collectibles" to find, one in each scene. This is an origami circle and you must find 15 of them. I'm not sure what could be added to this game to make it a CE, because there are also achievements to be earned. A couple of them are finding all the coins and origami circles hidden in the scenes. Again, cudos to the developers; these achievements are attainable, although not that easy. Few of them are based on time, so that helps a lot. When I finished the living room, I had not attained all the achievements, but I was allowed to continue to play the scenes to complete them. Wow, the more I write about this game, the better it gets! LOL. I've just upgraded everything to 5 stars. Great game and I'm ready to get back to playing it. 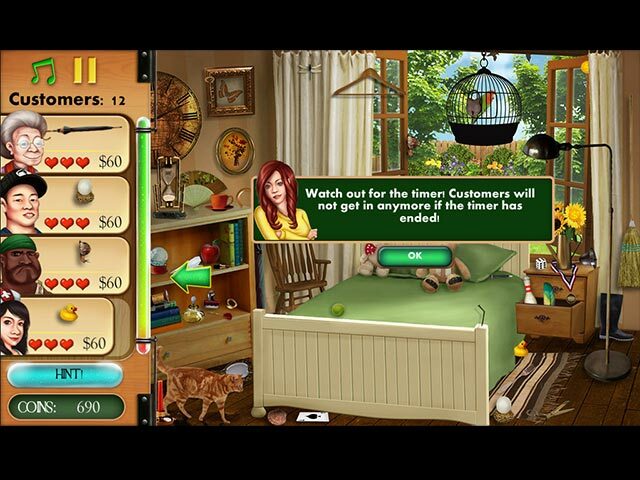 Rated 5 out of 5 by pennmom36 from Hidden Object Delight This is purely a seek and find hidden Object game where you are tasked with finding objects that customers want. The goal is to sell unwanted items around the house in order to make money to renovate the house (in demo you work on a guest bedroom) just like Gardenscapes. You can choose to play this game in Relaxed mode with no timer, otherwise, the longer it takes to find the customers item, the less money they are willing to give you. Each scene has a few gold coins to collect and a hidden Origami symbol to find and there are Achievements to earn as well. The money you earn is used to decorate the room with new flooring, wallpaper, windows, curtains, furniture and various decorations, each category gives you three different selections in three different price ranges. You can press and hold the ctrl key to zoom into the scene and use the mouse to click and drag the scene, but the items are fairly large and recognizable so you probably won't need to use that feature. After every seek and find game you will get to read a helpful household hint such as: Rubbing butter on the cut edge of cheese will seal and prevent the cheese from molding! The customers arrive on the left side along with the item they want displayed as either a text, a picture or a silhouette, and the price they will pay for the item with three red hearts. If you take too long to find the items, the customer will become impatient and begin to lose their hearts as well as how much they are willing to pay. When the items have been found you scan over the coins they leave allowing a new customer will arrive until closing time. There are two types of seek and find games that I absolutely loved, the customers arrive, but the listed items they want are scrambled so you must first find out what the customer actually wants, and then find the item! The second type was even better, you are shown pictures of a handful of items to memorize for about 15 seconds, then you have to find only those items in a scene. There are also scenes where you find multiples of a single item such as 20 cobwebs or 20 Origami figurines. There are also Match 3 mini games where you make matches below Stamps until the stams drop off of the board. This game however, was unimpressive an a wee bit boring in my opinion. This is purely a HOG, there is no adventure, no inventory items to collect and use, no complicated puzzles to solve. I must admit, I read a lot of useful tips that I haven't heard before, enjoy! Help Emma restore her grandparents' old house! Hidden Object, Match-3 and decoration all in one game.